Chariots of Fire is a classic. From the Vangelis score to the pre-Baywatch slow-motion beach running, the movie is packed with iconography. The film is also often lauded in Christian circles for its portrayal of Eric Liddell, the evangelical track star who stands by his Christian principles, refusing to compete on the Sabbath. 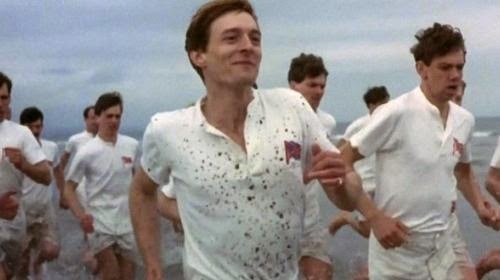 I’ve watched Chariots of Fire many times…I love it. Liddell’s decision in the film is treated so gently—it’s not preachy…it’s staged as a man making the decision that makes sense with his life, and he’s totally at peace with it—that I never wanted to write the “Liddell is living his life under the law, not the gospel!” post that the situation seemed to suggest. I’m going to write that post now…but not like I ever expected to. It wouldn’t be fair to Liddell (or to the film) to make fun of him for being so law-reliant and weak in his faith that the thinks sitting out an Olympic race that happens to take place on a Sunday will keep him in God’s good graces. In fact, he never says as much. As I recall, he simply claims that running on the Sabbath is something he won’t do. And as I said above, he’s not at all tortured by the law’s inhibition. Eric Liddell takes the law seriously. He interprets the fourth commandment, “Remember the Sabbath day, to keep it holy” (Exodus 20:8), as meaning that he shouldn’t do his work—and at the time, his work was running competitively for England—on a Sunday. So he submits himself to the law. This isn’t weakness—it’s strength. Seen this way, Liddell’s peaceful decision not to run is an acknowledgment of the good, right, true, and holy nature of the law…and maybe something to which we should all aspire. But, as you may know, the story doesn’t end there. The law never has the last word. And the Gospel is even better news than the wonderful news Eric Liddell gets in Chariots of Fire! Imagine Liddell’s joy: he has prepared for years to run this race for the glory of God and country. Now it seems that it won’t happen. Just as he has resigned himself to this, a gracious offer from another: “Take my place.” Eric must, however, still go out and win the race. This, of course, he does. We Christians are in Eric’s place, judged by the rightness of the law, unable to even compete. Our savior, though, gives us so much more than a spot in the race. Jesus comes to us, having qualified, competed, and won. He doesn’t give us work to do, he gives us a work completed. He hands us the gold medal he's won, and we find that it’s inscribed with our name. His victory is attributed to us. The law is good: it shows us that we have no place in this race. The Gospel is better: it shows us that the race is already won.